NMR in Pharmaceutical Sciences is intended to be a comprehensive source of information for the many individuals that utilize MR in studies of relevance to the pharmaceutical sector. The book is intended to educate and inform those who develop and apply MR approaches within the wider pharmaceutical environment, emphasizing the toolbox that is available to spectroscopists and radiologists. 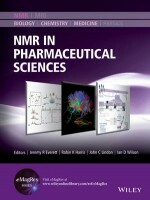 This book is structured on the key processes in drug discovery, development and manufacture, but underpinned by an understanding of fundamental NMR principles and the unique contribution that NMR (including MRI) can provide. After an introductory chapter, which constitutes an overview, the content is organised into five sections. The first section is on the basics of NMR theory and relevant experimental methods. The rest follow a sequence based on the chronology of drug discovery and development, firstly 'Idea to Lead' then 'Lead to Drug Candidate', followed by 'Clinical Development', and finally 'Drug Manufacture'. The thirty one chapters cover a vast range of topics from analytical chemistry, including aspects involved in regulatory matters and in the prevention of fraud, to clinical imaging studies. Whilst this comprehensive volume will be essential reading for many scientists based in pharmaceutical and related industries, it should also be of considerable value to a much wider range of academic scientists whose research is related to the various aspects of pharmaceutical R&D; for them it will supply vital understanding of pharmaceutical industrial concerns and the basis of key decision making processes.